Today I have installed new WHM/cPanel server on an AWS instance. Generally AWS servers are used key based login for ssh users and users don’t have root password. So I have manually reset root password through command line. 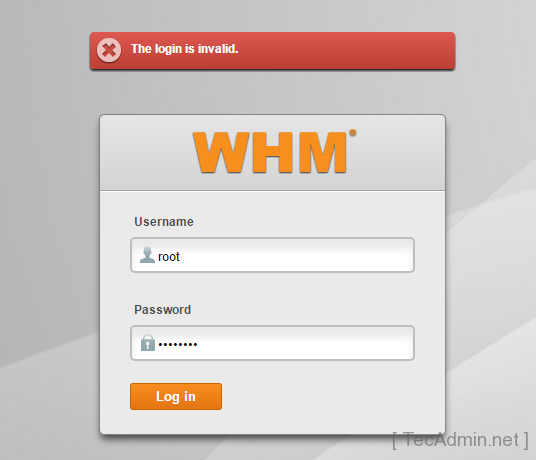 After installation of cPanel when I tried to login to WHM using web browser I got The login is invalid error even I was using correct login user and password. I tried the same thing by changing root password 3-4 times but still facing same issue. After that I google about this issue and found few solutions in which below solution work for me. This issue is creating due to my IP address was blocked by cphulkd. So I have added my ip to white list using following command. Make sure to change 11.22.33.44 with your actual public ip. To find your public ip visit here. After that I was able to login successfully using root account in WHM panel.